Spartans strive to address the world’s most pressing problems each and every day. 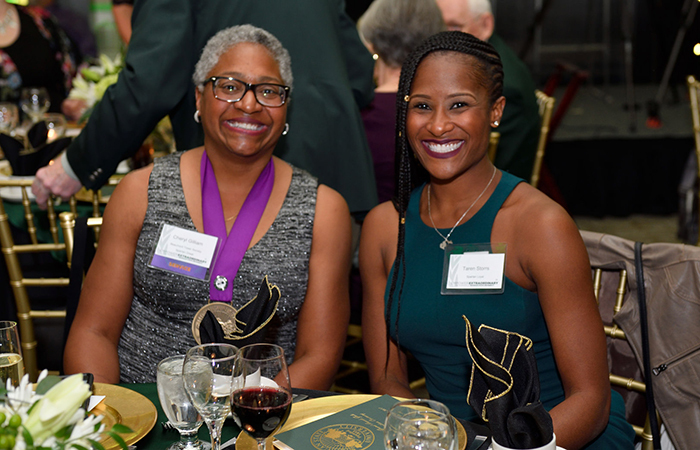 The Alumni Grand Awards program recognizes the best of the best — those alumni who are doing wonderful things and making an impact daily in their companies, communities, and for Michigan State University. A slate of truly impressive Spartans will be honored at the 2018 Grand Awards Gala, held on Friday, October 25, at the Kellogg Hotel & Conference Center. The black-tie optional event includes a reception with hosted bar, decadent meal, and the opportunity to meet and mingle with the recipients. The MSU Alumni Association recognizes Spartans annually, who positively reflect and enhance the prestige of Michigan State University, in five categories. Nominations are due each year by September 1 for selection the following year. Presented to Michigan State University alumni who have demonstrated service to MSU and/or meritorious public service on a local, state, national, or international level. Given to alumni who have differentiated themselves by obtaining the highest level of professional accomplishment in their field. Presented to non-alumni candidates who have made an outstanding impact on behalf of Michigan State University on a local, state, national, or international level. Presented to individuals, families, associations, corporations, or foundations with a proven record of providing major, ongoing financial support and leadership to Michigan State University. Their generosity encourages others to take leadership roles in philanthropy toward MSU. Given to Spartans age 40 or younger who have distinguished themselves through a high level of professional accomplishment early in their career. These individuals demonstrate a commitment to Michigan State University through outstanding continuous volunteer service on behalf of the university, and/or participation and leadership in meritorious public service on a local, state, national, or international level. Individuals, university departments, and alumni clubs may submit online nominations for consideration. Specific examples of how the nominee has demonstrated the characteristics outlined in the award category. For Distinguished Alumni Award candidates, specific examples of how the nominee has been engaged in improving the community, the state, the nation, and/or the world. Specific examples of how the nominee has been engaged in support of Michigan State University, or engaged others in support of MSU. Any additional information you feel is relevant to the assessment of the individual. Nominations are due each year by September 1 for selection the following year.